It is hard to know where to start when assessing the deficiencies that have seen Doncaster Rovers slide back into League Two. From performances on the pitch to matters off it, a catalogue of errors have cost Rovers their League One status and they only have themselves to blame. But when boss Darren Ferguson was asked to circle the biggest failing of a diasastrous season, his answer was as clear as day - Rovers could not handle the pressure. Ferguson’s reign to date has been bizarre in the extreme. 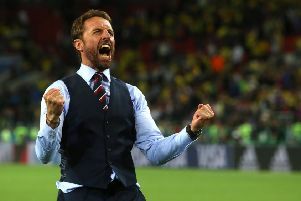 His first 15 games yielded nine wins and a team playing with passion and purpose seemed almost certain to gatecrash the play-off party, or at least comfortably finish mid-table. But following the turn of the year an excruciating run of 17 games without a win saw Rovers nosedive into the fourth tier for the first time in more than a decade. According to Ferguson, the squad’s inability to handle pressure situations is chiefly responsible - and it is something he will look to address this summer. “When I look at the run we went on before Christmas, although I never talked about it publicly, I think the players realised they were quite close to the play-offs and I don’t think we dealt with that very well,” Ferguson told The Star. “There was a little bit of pressure there then. “Then I think we lost four on the bounce by one goal within about two weeks, against Port Vale, Walsall, Sheffield United and Barnsley, and before we knew it we hadn’t won in six. “At that point we struggled to deal with that. “And then I look at the Wigan game when there was no real pressure [because we had nothing to lose]. We win it. “At Chesterfield we probably should’ve won the game. “Against Coventry, there wasn’t much pressure on us. We win it. “Blackpool get beat and we play Crewe half an hour later than anyone else, a bit of pressure, and we lose it. “We haven’t dealt with the games we’ve really needed to win. “We lost to Scunthorpe twice, we lost to Sheffield United, we lost to Barnsley - all derby games. “We’ve not dealt with adversities within games and over the season, when results have gone badly.